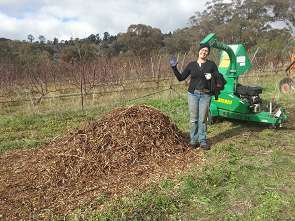 Author KatiePosted on April 12, 2019 April 12, 2019 Categories biochar, Disease control, Fertiliser, Grow Great Fruit, grow your own food, Home grown food, Natural fertility, Organic growing, Permaculture, Pruning fruit trees, Soil healthTags #growgreatfruit #organic #growyourown #homegrown #treehealth2 Comments on What to do with prunings? 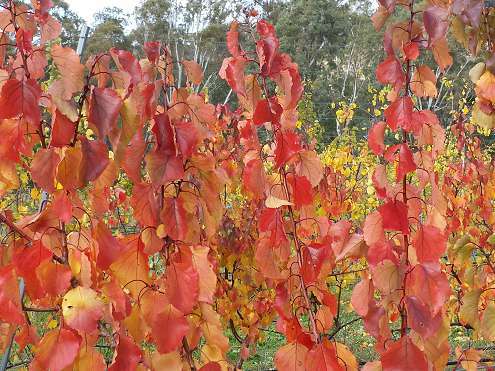 With winter on the way and our minds turning towards tree pruning and maintenance, here’s two simple techniques to help look after the structure of your trees. 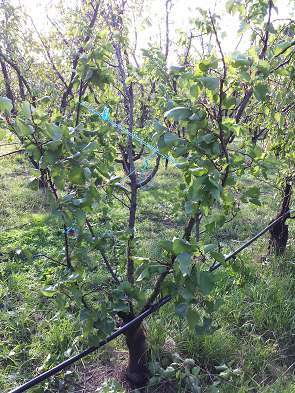 The first one is a trick we use in the orchard to help trees shape up – literally! We often use baling twine (some people call it hayband) to hold limbs in the right place, or to offer support to a young limb while it strengthens up. Never tie the twine tight around the branch, because it can quickly become too tight and strangle the branch. Instead, use one big loop of twine or rope that goes around two limbs that are opposite each other (the weak one that needs holding up, and a strong one on the other side of the tree) – think of it like a big rubber band. Review it next year, and remove if the weak branch has become strong enough to hold itself upright. 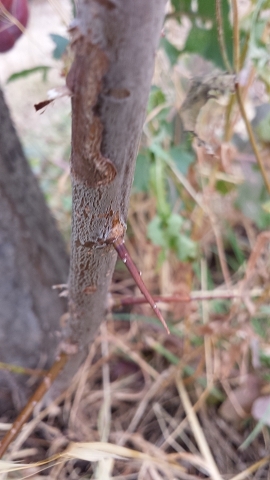 Be careful when you’re working on branches that have been tied together, e.g. 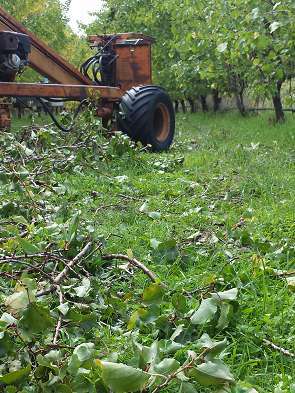 pruning, thinning or picking, because they won’t be as ‘stretchy’ as usual and it’s actually easier to break them if they’re tied together. 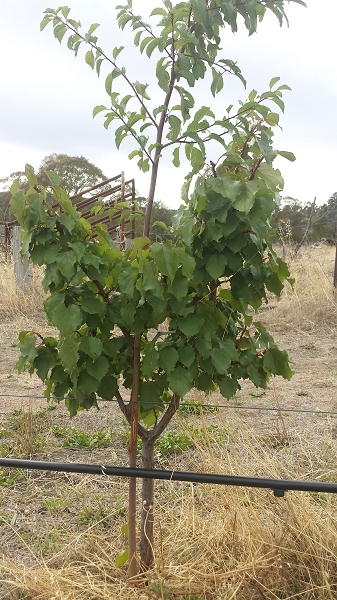 A similar technique can also be used to help hold a broken branch in place after you’ve applied a ‘splint’ to help it heal, which is the second technique we want to show you today. 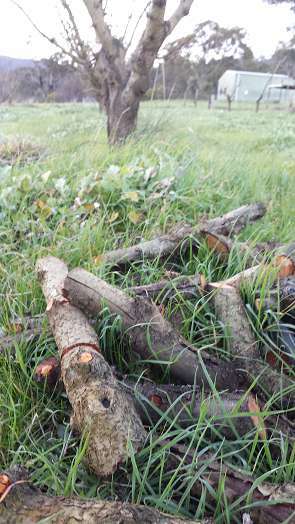 A broken branch can often be put back together, as long as there’s still enough wood and bark in place to have maintained the flow of water and nutrient from the roots to the broken piece, and if the two broken pieces will fit neatly back together. 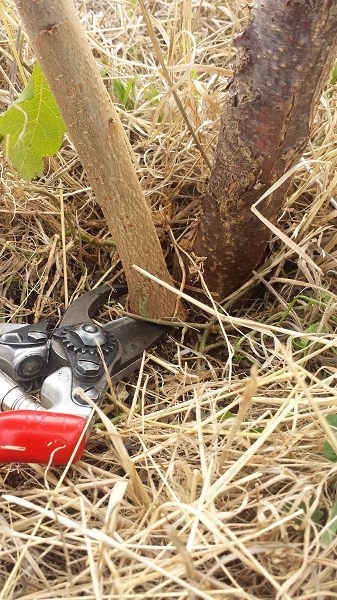 In much the same way as wood heals when we do a graft, broken branches can be encouraged to heal by holding the two pieces together and binding firmly in place – you may need to prune away some jagged pieces first to get a neat fit. We’ve used grafting tape in the photo above to hold the split firmly in place. If you don’t discover the break immediately, it may have already started to heal in the broken position, in which case it can be a bit harder to get a really tight seal (as you can see in the photo above). In this case it’s a good idea to bind them as close as you can get them to start with, then come back in a month or so, remove the bandage and see if you can get the two pieces to fit together more tightly, then bandage again. Here’s another example of the same technique, used to repair a trunk that has split in half. Cable ties have been used in this case, to get a really tight seal between the two broken pieces. 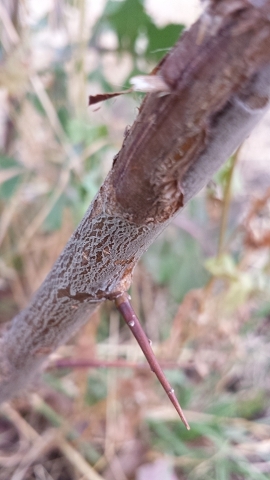 As with grafting, it’s important to remove the bandage when the wound has healed so it doesn’t provide a strangulation point as the diameter of the branch naturally expands as it grows. 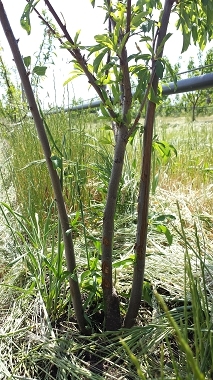 Now is also the right time to be getting ready for the regular winter maintenance pruning (if this topic is confusing take our Pruning Mature Fruit Trees online short course to get a handle on it), so this is the perfect time to do any shaping or repair any breaks you missed during the summer.